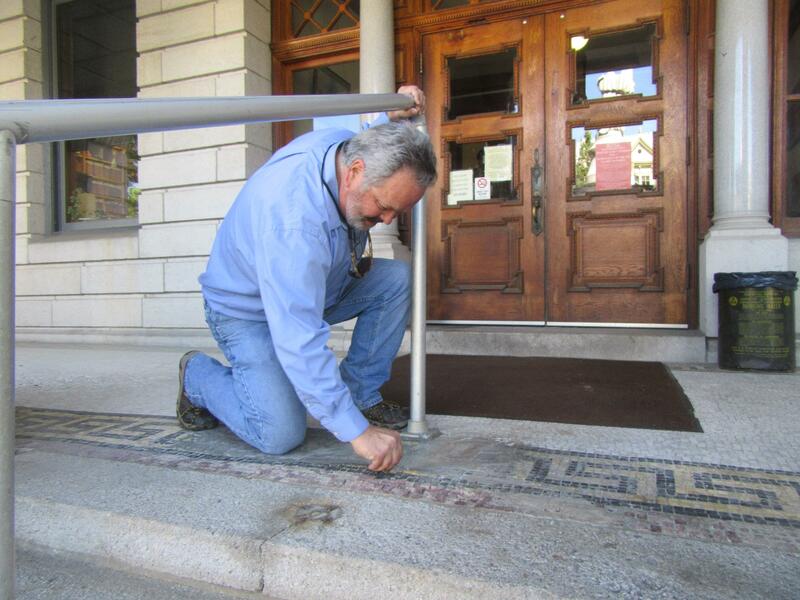 Bradford County Maintenance Director Kim Corbett (above) recently provided an overview of work that is needed at the front of the courthouse in Towanda, including repairs to the mosaic floor at the entrance. Visitors to the Bradford County Courthouse can expect to traverse a network of scaffolding for the foreseeable future as the scope of work on the 120-year old building continues to expand. As the replacement of the roof is nearing completion, the next projects will target the front of the building and will be done in three parts, though in no particular order. The county is currently taking bids on the projects, which were estimated at about $275,000 last year but are more likely to come in around $340,000. Investigation of the steps and porch ceiling at the main entry to the courthouse revealed underlying problems that were not previously addressed or were not mendedadequately. The use of Impact Fee funds have made it possible for the county to make proper repairs this time. The massive blocks that make up the staircase, for example, were set in a sand base about 6 years ago and repointed. Some of those recommendations are coming from historical conservationist Lori Aument, who Corbett credits with ensuring that the new work will both hold up and preserve the architectural integrity of the iconic structure. 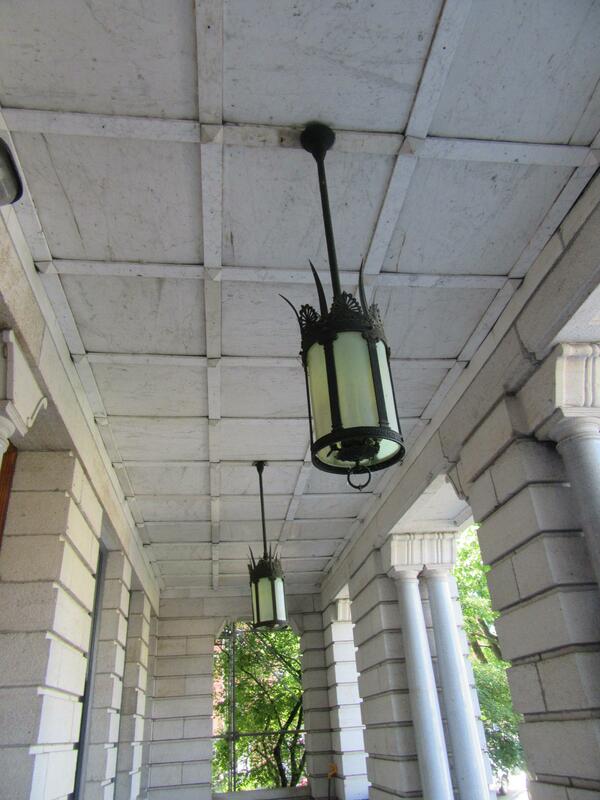 Aument has more than 15 years of experience in rescuing old buildings and preserving historic sites. 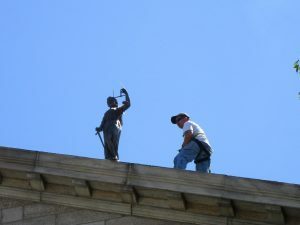 She holds a Master’s Degree in Historical Preservation from the University of Pennsylvania and has built her career on understanding traditional and obsolete building materials. The courthouse stairs will be numbered and removed, Corbett related. A suitable base material will replace the sand, and the steps will be put back with a combination of mortar, rubber and epoxy holding them in place. 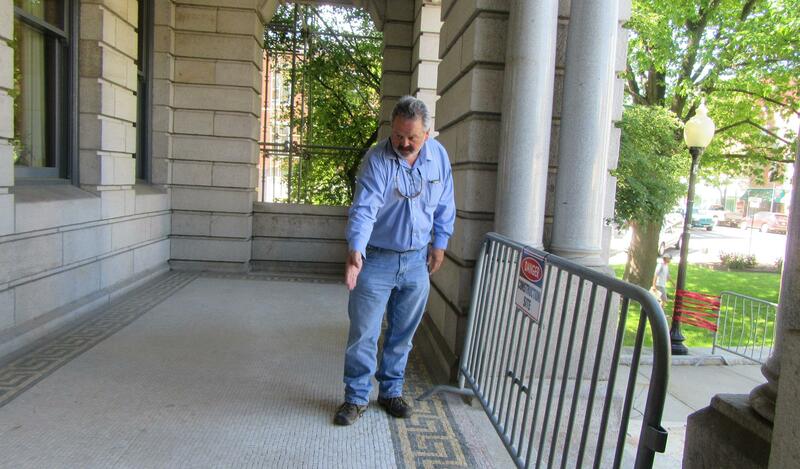 Another item on the repair agenda is the mosaic floor that greets visitors as they climb the stairs to the courthouse. Corbett reached down and easily pulled up one of the three-quarter-inch tiles. “There’s some underlying issue, and we’re not sure what it is,” he remarked. As a result, the floor has become uneven with pits that catch shoes and could lead to falls. The majority of the tile – that which is walked on the least – is still secure and will not be removed during the repairs. Perhaps the most tedious of the projects is the planned repair and replacement of the marble ceiling tiles, measuring two-by-three feet each and held in place by a combination of marble battens and pyramidal caps. “Some of them are very brittle,” Corbett said of the pieces, adding that the framework above the ceiling tiles is also deteriorating, despite having been addressed several times over the years. “It’s kind of a hodge-podge,” Corbett said of the ceiling’s support system. All of the pieces will be removed and any found to be broken or too brittle will be replaced. Despite the ongoing repairs, Commissioner Doug McLinko remarked at a June 8 meeting that replacement of the courthouse dome last year, which included many interior enhancements, and the pending completion of the copper roof have made the building a showcase and a worthy destination. “Anybody in the county who hasn’t been here in a while should come and see it,” he stated.